Visit Homestay Hong Saeng for recipes. There are dozens upon dozens of herbs and spices, from commonplace black pepper to more exotic turmeric and cardamom. But all share two unique features: they add incredible flavor and aroma to food, especially low-salt dishes where flavor can sometimes be lacking. Herbs and spices are necessities in the fight against fat. Too often, they are relegated to attractively labeled but rarely used bottles on revolving spice racks. This is unfortunate, because using the right blend of these taste enhancers produces delicious, low-calorie dishes that will make it easier to stick with your new weight-loss-friendly eating habits. Most dried herbs and spices are low in calories, providing about 4 to 7 calories per teaspoon. So feel free to use them even if you are following a low-calorie regimen. Some are surprisingly good sources of nutrients. Paprika is an excellent source of vitamin A, parsley is rich in vitamin C, cumin is an unexpected source of iron, and caraway seeds even contribute a little calcium to your diet. New research findings suggest that several herbs are also rich sources of antioxidants that may possibly prevent the growth of cancer cells and protect delicate arteries from oxidizing damage that begins the buildup of plaque. Among them: allspice, basil, clove, coriander, dill, fennel leaves, mint, nutmeg, parsley, rosemary, and sage. Aside from their nutrient and antioxidant contents, there are many health claims made for individual herbs. Here are but a few: Mint relieves gas and nausea; cinnamon enhances insulin’s activity; oregano has antiseptic properties; sage contains compounds that act as antibiotics; thyme is said to relieve cramps. Most, however, have not been scientifically proved. In our opinion, fresh is best. But it’s not always easy to find fresh herbs. Farmers’ markets are your best bet. Supermarkets may carry them year-round in small, clear plastic containers or bags. You may find them through internet Web sites, or you can grow your own windowsill herb garden. In any case, buy fresh herbs only as you need them. Wrap them in damp paper towels, place in a plastic bag, and refrigerate or store in their plastic containers. They should last a few days to a week. When fresh aren’t available, dried will do. Store dried herbs and spices in airtight containers, away from heat and light (over the stove is the worst spot). Dried herbs will keep for a year. Whole spices, like cloves or cinnamon, keep much longer. 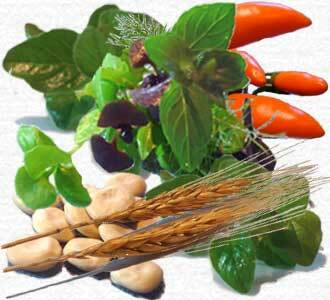 The flavor of dried herbs tends to fade faster than that of dried spices. Becoming acquainted with herbs and spices is a must if you’re committed to low-salt cooking. When you remove salt, a lot of flavor goes with it. That loss of flavor can be masked with herbs and spices. If you’re a novice at using herbs and spices, start by using only one or two per dish. If you’re using fresh herbs, don’t be shy. Their flavors are often subtle, and it usually takes more than you think to flavor a dish. With dried herbs, however, a little often goes a long way, so use judiciously. Start with about 1 teaspoon until you get a better feel for the amount you like in dishes. If you’re cooking with fresh herbs, wait until the end of the cooking time to add them, so they’ll retain their delicate flavor. Dried herbs and spices, on the other hand, hold their flavor well — even under intense heat. If you’re looking to add herbs and spices for a genuine multinational dish, try using fresh cilantro for a distinctive Mexican flavor. For Asian flavor, use fresh chopped ginger. Get Italian flavor with fresh basil. To flavor your food, reach for herbs and spices rather than high-sodium table salt. Be sure to read the labels of seasoning mixes because some contain salt. Visit our web-site Homestay Hong Saeng for more recipes. Cut unpeeled bananas lengthwise; brush melted butter over cut sides. Grill bananas, cut side down, over medium-hot coals 2 minutes or until lightly browned; turn. Grill 2 minutes or until tender. Coming to the end of the year, is time to add a bit of flash and color to your food. The skies are in your country perhaps low-hanging and weepy. The days are short, getting shorter. Each fall and winter, there is a must for all manners of dried fruits, juicy citrus, and rosy pomegranates. They work beautifully in salads, including this jewel-inspired ensemble. Mixed leafy salad greens, wild rice, toasted hazelnuts, dried figs and pluots are combined in a big bowl and then tossed with a simple ginger juice vinaigrette spiked with just a hint of jalapeno. It’s festive with enough going on flavor-wise to keep people guessing. The key to an amazing salad is seeking out the very best lettuce you can find. In this instance a blend of red romaine and little gem lettuces is great. Avoid bagged, pre-washed lettuce – it often smells off. I baby my lettuce all the way home, making sure other groceries don’t smash or bruise it. To clean it; tear the lettuce into manageable, bite-sized pieces, wash it gently in cold water, and then spin it dry. If not using it immediately, re-bag it with a clean (lightweight) dish towel and place it back in the crisper until I’m ready to toss the salad. Feel free to substitute other dried fruit if it is more convenient. Just try to imagine if it will pair nicely with ginger and go from there. I also do my best to seek out unsulphured dried fruit when we are shopping in our ” Tesco Lotus ” superstore in Ubon Ratchathani. As mentioned before, in this instance use a festive combination of leafy red romaine lettuce along with some little gem lettuce, but buy whatever lettuce looks the most vibrant at the store. Feel free to make the vinaigrette the day before. In a mason jar or medium bowl make the ginger vinaigrette by whisking together the ginger juice, vinegar, jalapeno, and a couple big pinches of salt. Slowly drizzle the olive oil into the jar whisking all the while. Stop when the dressing takes on a slightly creamy appearance. Taste and adjust the flavors if needed. Set aside. Hold off dressing the salad until just before you are ready to serve it. This will help to keep the lettuce vibrant and lively. In a large bowl toss the figs, pluots, hazelnuts and wild rice with a generous splash of the dressing. Once they are nicely coated, add the lettuce, a bit more vinaigrette, and a pinch of salt. Gently toss until the lettuce is evenly coated. Taste and adjust if needed. The little bits of fruit and nuts tend to fall to the bottom of the bowl, so before serving scoop them back up from the bottom so you end up with plenty of rice and fruit on top. I am living with my wife inside a tiny rice-farmer village in the district Loeng Nok Tha, province Yasothon, Thailand. When we go to the market in Loeng Nok Tha together – this does not happen every day – I can see the curious fruit that looks like a blowfish mated with a Venus fly trap? The dragonfruit, also called the pitaya or strawberry pear – and in Thai ” Kaew Mang Korn ” – , is one of those strange-looking things you see in a market and just have to try. Here in Thailand’s North-East, dragonfruit is sold at almost every market and served as dessert at many higher-end restaurants. Dragonfruit is also happily consumed in Vietnam, Malaysia, and many other sub-tropical places. Dragonfruit with the pink flesh tend be sweeter than the ones with white flesh. But I’ve also had sweet versions of the latter, like this one sent all the way up to a supermarket in Beijing. You can find dragonfruit jams and wine, and use them in homemade salsas or even mooncakes. My favorite way of consuming of dragonfruit is diced up in a fruit salad, perhaps with clementine slices and grapes. Or simply cut the whole fruit in half and eat it one delicious scoop at a time. I may try out the salsa recipe at a later date though.